The front oval is cut out, revealing the Nativity scene inside. The Die-cut version of the Mistletoe Christmas Card — cut out the oval inside from the front and inside front. 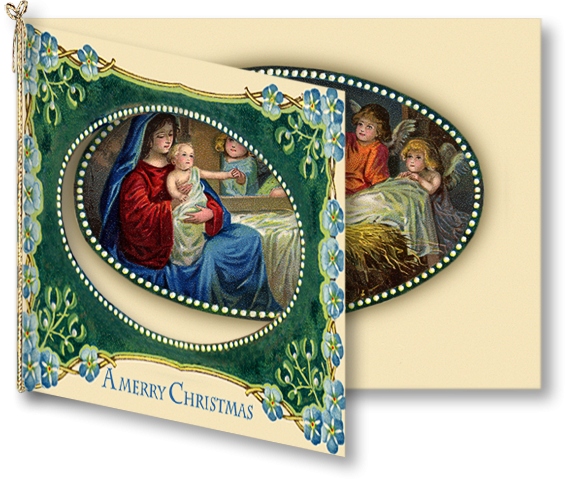 The Mistletoe Die-cut Christmas Cardfeatures a 3-D look: a front oval is cut out to reveal the nativity scene inside. Creating this card is quite simple with our DownloadableMistletoe Die-cut Christmas CardPDF and included easy instructions. As you can see from the diagram at left, all you need to do cut-out the front oval, besides trimming the white areas outside of the card margins. And if you're feeling adventurous, you just might enjoy trying the Mistletoe Die-cut Christmas Cardvariation shown below, left. Besides the front oval, you cut out around the front garland as well, giving your card even more of a vintage die-cut feel. After cutting out the page featuring the Nativity, you paste it inside the card back. Then, fold your card along the spine, and voilá — theMistletoe Die-cut Christmas Card. You must have a valid account to post comments. 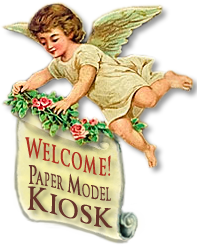 Please login to the right or click the register button to create an account. Then return to this page to post your comment! Mouseover a small image to see it large. Create a vintage-looking die-cut card with a few cuts and one fold. Size: 5.25 x 3.75 inches. Buy Mistletoe Die-cut Christmas Card as part of a collection, and save!